The Keeler Centre is a state of the art facility providing a perfect indoor location for our Jamboree regardless of weather. The acoustic tiles makes for great sound, room for table and chair seating as well as room for dancing, excellent clean washroom facilities, a full time snack bar for all your snacks and refreshments plus a licensed bar for heavier refreshments. (NOTE: under LLBO license). No beverages to be taken in or out of the building, STRICTLY ENFORCED. 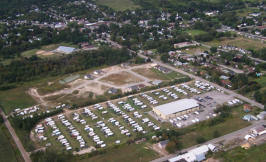 The centre is located just 5 to 10 minute walk from our main street in Colborne, which is a unique small town midway between Toronto and Kingston just off Hwy 401. It is located at exit 497, marked by "The World's Biggest Apple". There are many unique shops on the main street and a full line grocery store, liquor store as well as two convenience stores, a pharmacy open 7 days a week with a pharmacist on duty everyday.